U.S. stock futures plunged 500 points Thursday, extending its two-day loss by more than 1300 points. Dow Industrial Average Futures closed 546 points or 2.1 percent lower at 25,052.83, totaling more than 5 percent in losses since Tuesday's close. The tech-centric NASDAQ ended 1.3 percent lower at 7,329.06. S&P 500 futures closed at 2,728.36, down 2 percent. Previously high-flying tech stocks extended losses on Thursday. The two biggest U.S. companies continued losing value, with Amazon shares ending 2.0 percent lower and Apple shares closing down 0.9 percent. The recent rise in interest rates, while not sudden, is adding to investors anxiety about the markets, Mike Matousek, head trader at U.S. Global Investors, told ABC News. "Quantitative easing was great -- the Fed was buying U.S. bonds. Now that they're tapering off and not buying as much, but the government still has to issue bonds to fund the government. And nobody wants to buy bonds because rates are higher, and it costs more and you're going to lose money because the Fed keeps raising rates. Why would I buy something that will cost me something in the future when I know it ahead of time?" Matousek said. Growing trade tensions with China -- the largest holder of U.S. foreign debt by far -- is also adding to market insecurity. As a result of the trade war, "China is selling our treasuries and bonds. If you borrow a lot of money from the bank, they own you. China is the bank," Matousek said. President Trump defended his policies and continued his long-running feud with the Federal Reserve on Thursday, attacking its current policy of continuing to raise interest rates. "It's a correction that I think is caused by the Federal Reserve, with interest rates," Trump said. The central bank has raised rates three times this year and another rate hike is expected in December. "We have interest rates going up at a clip that's much faster than certainly a lot of people, including myself, would have anticipated. I think the Fed is out of control. I think what they're doing is wrong," Trump added. "Under the Obama administration, you had a lot of help, because they had very little interest. You know, when you talk about economies, our economy is far better than that, but we have actually -- we're paying interest, and they weren't. They were using funny money." "But I think the Fed is far too stringent, and they're making a mistake, and it's not right. And it's -- despite that, we're doing very well, but it's not necessary, in my opinion. And I think I know about it better than they do, believe me," Trump said. He added that he would not fire Chairman Jerome Powell. The benchmark Dow index fell 831 points to close at 25,598.74 on Wednesday, wiping out 3.2 percent of its value in the sharpest drop since February. Paul Sankey, a managing director at Mizuho Securities, mentioned Wednesday's dramatic market slide in his morning note to investors. "Obviously the backdrop was the 800 point drop in the Dow yesterday, which had the traders shouting 'tech wreck!' as I crossed the floor in the afternoon when the market slide turned into a rout," Sankey wrote. 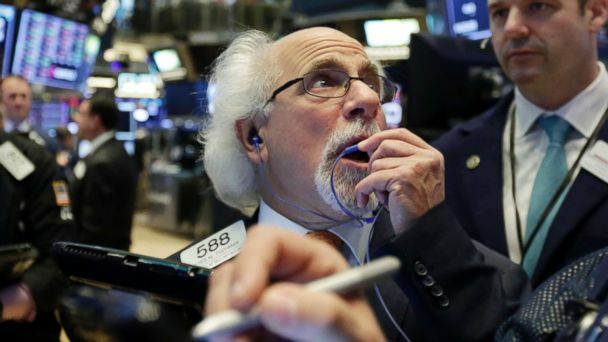 The decline came amid a widespread sell-off on Wall Street, which spilled over into global markets overnight as investors reacted to the "sheer magnitude of the move," OANDA analyst Stephen Innes wrote in a note to investors. "Equity markets were pulverized today as investors remain in full out retreat and even the most pessimistic of equity bears are still in shock by the sheer magnitude of the move," he added. "This meltdown isn't just a mild case of the sniffles suggesting the latest sneeze from the U.S. equity market could morph into a global markets pandemic." Innes, the Singapore-based head of Head of Trading for Asia Pacific with OANDA, attributed the slide to a combination of factors, including the possibility further interest rate hikes and the battle over tariffs between the U.S. and China. "President Trump's scathing and ramped-up attack on the Fed has the dollar bulls retreating as even the hint of political interference on monetary policy is unsettling," Innes said. Asia stock indexes added to the global market's pain on Thursday, with benchmarks in Shanghai, Shenzhen and Tokyo all skidding between 4 and 5 percent. Japan's benchmark index tumbled about 3.9 percent, while China's key index fell 4.3 percent. Market indexes in Hong Kong, South Korea, Australia and Southeast Asia also moved lower.